Made to order Valentines decorations and gifts from 5mm thick clear acrylic with laser cut polished edges. All supplied with ribbon for hanging. Please add the message you would like to appear on the item in the 'notes' section of your order or by separate email. If orders are received without a message we will contact you via email to confirm this. Any delay in responding will delay your order. Notes will be added EXACTLY as written in the notes section so please check all spellings as these cannot be amended once produced. 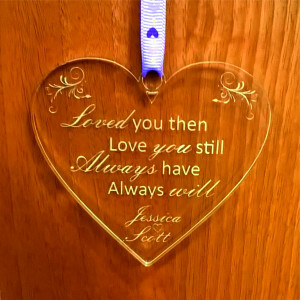 Engraving will be sized according to the decoration at our discretion. Approx size of decoration is 100mm wide.